Anyone who has ever shared a meal at my home has probably eaten on some of my blue and white dishes. This color combination is one of my all-time favorites, and so many beautiful dishes are available in these classic colors. My love affair with these dishes began when my grandmother Norton introduced me to the Blue Willow pattern. Since then, my collection hasn’t stopped growing. One of my favorite ways to use blue and white dishes is to mix and match them. Because they are all in the same color scheme, combining pieces from different patterns is a foolproof way to keep your table looking fresh. From Stagecoach to Blue Calico to every pattern in between, there are endless possibilities for using blue and white dishes. They can be used for everyday dishes or dressed up with fancy linens for a more formal table. A simple afternoon tea is a way that I mix my blue and white teacups, teapots, and saucers. These dishes are multi-seasonal and perfect for a sunny summer meal or a hearty winter dinner. I never get tired of exploring new ways to use blue and white dishes to bring personality to my table. Do you have a favorite china pattern? Hi Phyllis! All of my home’s dishes are mismatched blue & white too, and that’s why I decided to design my own set of dinner plates. (I’m an artist/Illustrator). I would love to share them with you, so please contact me back and I’ll send you some photos. They are all serene flora/fauna combinations and are definitely different than the other pieces in our collections. I would SO love to hear what you think of these. I love any older blue & white dishes also. My grandmother had Blue Willow so I was introduced to those early. Just last week I found a set of Blue Willow Demi tasse cups & saucers at a thrift store. Score!!!! Love your magazines & blog. I sometimes feel I’m the only lady who doesn’t put Blue & White as the top choice for her dinnerware! Our “everyday” dinnerware was Johnson Brothers’ Trivoli White and Haviland’s Shelton was our china choice when we married. Both are simple patterns that can be used in innumerable ways! When my future husband moved to a cabin in the woods upon returning from the service, he wanted “homey, old fashioned” dinnerware; thus, his parents gave him a set of Blue Danube. When we met and married a few years later we rather unexpectedly acquired a much larger set as a result of a shower given by his neighbors. I guess everybody needs a bit of Blue & White! Although we have added other patterns through the years, we still very much enjoy these three. I had a very large collection of blue and white and paired it with different colors for different seasons. I now have only one set of blue and white and still pair it with other colors. I do have other dishes I love and use also. Love your blog! I was “born into blue” with a September birthday (flower: blue aster; birthstone: blue sapphire). I love all things blue, especially my dishes: Blue Ribbon Faience China ( Arabia of Finland), Blue Chelsea (Adderley English Bone China), Blue Delft (Holland), Porsgrund Commemorative Plates (Norway) and a nice collection of antique Flow Blue pieces. P. S. I have blue eyes, too. I have some of my grandmother’s Blue Danube. Blue and white is timeless. Your collection is beautiful. It is a joy to use! One of my earliest memories is of my mom’s friend’s kitchen, her blue gingham curtains and how I told myself – “I’m going to have a blue and white kitchen when I grow up!” 🙂 And today, my living room is in colonial blue and white with many of those beauties you show here lining my walls. 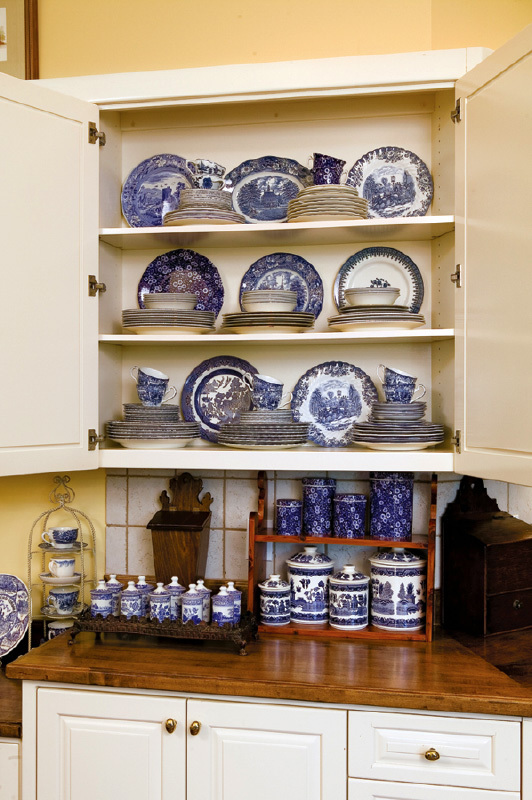 My kitchen is all white with English Staffordshire blue and white… I recognize some of my own in your collection – even those Spode blue and white spice jars (though it looks like you have a full collection! I simply have Rosemary, Sage and Thyme…) 🙂 I can’t get enough of the blue and white, always reminds me of England, home, skies sailing with puffy clouds and sea waves laced with white froth… LOVE your pictures and post here! I love blue and white together and yes, these colours work together beautifully with almost any other colour. I have dishes in the blue and white calico pattern, some blue willow and a contemporary blue and white nautical set for summer. I also have blue and white ceramic cook ware from Temptations. One pattern has a bit of dark brown in it and is simply stunning. Thanks to everyone for taking part in the blue and white love fest!! Blue and white must be one of those universally loved color schemes! It is so fresh, so clean and evocative of so many lovely and happy times and places. I too, have many domestic items in this theme. I love my Calico Blue tea set, which was a gift from my parents , but I have also used the blue and white scheme with white wicker furniture, in my den, as well as in bathrooms. It reminds me of happy times spent travelling in Greece and France! Phyllis we share a deep and passionate love for blue and white! I remember as a little girl collecting blue glass and porcelain. 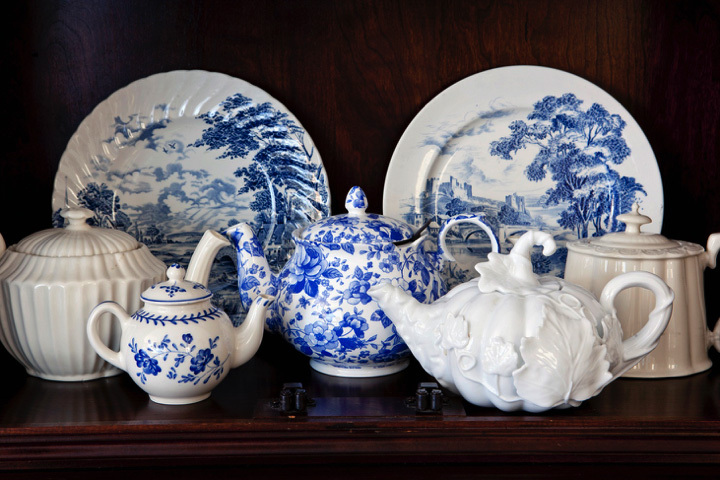 That passion has grown over these many decades and now many of my China patterns are blue and white. One favorite is Copeland Spode’s blue Fitzhugh. I am very proud that several of our American Presidents have actually displayed this pattern in the niches of the Oval Office. Purchasing my Fitzhugh was one of my favorite auction stories! In Florida many people are thrilled to retire to the Sunshine State! When they pass away, often their relatives live in other parts of the country and simply hire auctioneers to sell their belongings. At one of the auctions the lady had exquisite belongings, including the Copeland Spode Fitzhugh. She had 8 place settings and countless gorgeous serving pieces including the teapot, the coffee pot, the sugar and creamer, and various serving dishes. The lot came up at the end of the auction and everyone was tired, especially the auctioneer. He flippantly said. “Well we’ve got a nice little set of blue dishes… ” My heart secretly rejoiced because I knew he had no idea what they were!!! I bought all of them for $300!!! They are now proudly displayed in one of my antique hutches and have brought much joy especially when using them on Memorial Day, the 4th of July, and Labor Day. I wish I could attach a photograph! Thank you for sharing more of your beautiful collection. I especially love your white pumpkin teapot! Looking forward to all of your wonderful blogs in the future! We love you with all our hearts dear Phyllis. I think you can use touches of blue and white in every room, even when it’s not the central theme colors of the room. It’s just pleasing to the eye. I bought a set of Spode Blue Room plates that I use every day. Also a lovely set of matching luncheon plates. They have the classic look of transfer ware but can handle the wear and tear of everyday use. If someone swings by unexpectedly for lunch, they admire the plates and think I went all fancy for them. But I like having it all fancy for me every day, too. Although the Blue Willow china is beautiful my husband is skittish around such dishes, afraid he will break them. We opted for simple square-ish plates from Ikea so they are easy to replace if broken, (and they have.) I love “pool blue” in a kitchen and luckily they came in that color. They didn’t have all the pieces I wanted in pool blue so I mixed it with white and was able to find small turquoise glasses to match. It’s simple but lovely. underneath. How I long for the look again and now have a special item to put on my Christmas list this year. I’m so sad for losing Mom but so happy for all the traditions and memories she has given me. I always provided the flowers for the table to make it all complete. I fondly remember the gravy boat going back to the kitchen for refills! I too love blue and white dishes. My grandmother used Blue Willow as her everyday dishes. At the time when she passed away, I was in college and did not really think about wanting her dishes. Later on when I had a home and children of my own, I wished I had her dishes so I started my own collection of Blue Willow. I used them last night for a family birthday celebration and teamed them up with a bright green woven place mat on a blue & white tablecloth. They look great with many colors – red, hot pink, green and just white. Many times I use them with my red crystal. I always enjoy seeing photos in the magazines of homes decorating with blue & white dishes. My first blue and white came when I was very small: a tiny Blue Willow doll’s tea set. It is marked “occupied Japan” so it is easy to date. I loved it and used it enough to chip several pieces. I have it still – displayed nicely in a cabinet in our daughter’s old bedroom. The blue and white always brings a smile to my face. Phyllis, I also have a thing for blue and white dishes and I love when I see them in all your gorgeous magazines! You always do such a beautiful job!!! Growing up, my girlfriend’s mother was a fabulous cook. On top of that she had the most beautiful sets of blue and white china. I loved being invited for dinner and was in awe every time! In my family, it was the ongoing joke that my mother was probably the worst cook in the world. I do not know how we survived! Anyway, what she lacked in the kitchen, she made up for in every other aspect of her life! On my first wedding anniversary, she brought over tons of old boxes from a recent estate sale for my husband and I to open. What a wonderful shock! Out from old wrapped newspapers came stunning pieces of old blue and white dishes! Several years later, she surprised my young daughters with a beautiful blue and white child’s tea set. That set us on a mission to collect more of the same, with child’s hutches to display and even some antique children’s pewter pieces to accompany for the many crazy tea parties they had! Later in life, my mother became an antique dealer and I had the pleasure of scouring anything old with her… barns, attics, basements, estates and even a dump once, to find some wonderful treasures! Blue and white child’s tea sets and dishes just have a special place in my heart! What can I say!!! Thank you Phyllis and all at Hoffman Media for all the wonderful pages that tweak or memories and warm our hearts!!! Phyllis – I met Julia Childs in the early 1970s when we were neighbors in Cambridge not far from Harvard Square as we would frequent the same small deli market near where I worked at The Architects Collaborative (TAC). She was, indeed, a prominent woman for her culinary expertise and after an enjoyable afternoon to visit with her in her green-clad Federalist home, I came to appreciate her predominant collection of blue-white porcelain dishes, crockery terrines from China (where she lived at one point) and a heavy emphasis on white clay/porcelain heavy serving pieces. There were well-worn, unmatched and rather sizeable platters in an almost studied cluttered placement in her kitchen and small dining area. Years later and many travels of my own, I started collecting the popular blue-white, chrysanthemum-decorated Chinese soup bowls, later following with the New England old English traditional porcelain (Spode) ginger jars and similar platters. The blue-white scheme was always attractive to me as it was visually very workable with any home decor style I used. Years later I met up with Julia on Cape Cod where I had a weekend home and she arrived at a lovely book-signing reception in her honor – and she fondly recalled our prior visit. I still have her inscription on my copy of her The Way to Cook (1989). An inspirational woman in every sense. Phyllis – I met Julia Childs in the early 1970s when we were neighbors in Cambridge not far from Harvard Square as we would frequented the same small deli market near where I worked at The Architects Collaborative (TAC). She was, indeed, a prominent woman for her culinary expertise and after an enjoyable afternoon to visit with her in her green-clad Federalist home, I came to appreciate her predominant collection of blue-white porcelain dishes, crockery terrines from China (where she lived at one point) and a heavy emphasis on white clay/porcelain heavy serving pieces. There were well-worn, unmatched and rather sizeable platters in an almost studied cluttered placement in her kitchen and small dining area. Years later and many travels of my own, I started collecting the popular blue-white, chrysanthemum-decorated Chinese soup bowls, later following with the New England old English traditional porcelain (Spode) ginger jars and similar platters. The blue-white scheme was always attractive to me as it was visually very workable with any home decor style I used. Years later I met up with Julia on Cape Cod where I had a weekend home and she arrived at a lovely book-signing reception in her honor – and she fondly recalled our prior visit. I still have her inscription on my copy of her The Way to Cook (1989). An inspirational woman in every sense. 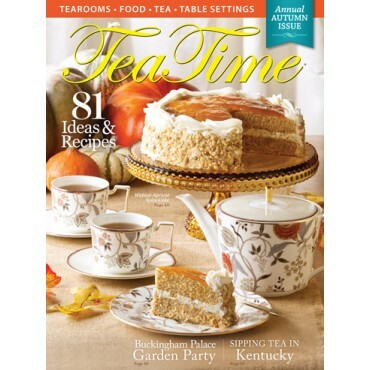 May I please ask if anyone knows the name of the pattern for the teapot shown in the center of the picture? I just love it! I love blue andwhite but the delicate white does blend all others together. Lots of memories here and current joy in finding .more! Phyllis, 40 years ago my mom asked me what china pattern I wanted to use, and I asked for Royal Albert pattern Memory Lane! I loved the delicate blue and lavender forget- me-nots that grace the rims! For many years one piece or another appeared under the Christmas tree! more recently, I received a lovely two cup Adderly cornflower tea pot for mothers day! I must say though I am smitten by the joyous blue and white calico in the photograph! I am a huge fan of blue and white. You can mix and match, pick up odd blue and white pieces at yard sales. My grandmother always used the willow pattern China and told me the story of the pattern dipicted on the china. I never got tired of hearing it! So love my Roseville, Noritake, shipped to me while my boyfriend (now my husband) was serving our country in Korea. I interpreted correctly that the service for 12 with extra serving pieces was an engagement gift. And imagine, relationships endured many months with no phone calls, texts, or emails….just those thin, blue airmail envelopes. I also love blue and white use those dishes also. I have a collection of the red and white transfer ware that I started collecting when we were stationed in Germany. I purchased pieces at Church garage sales, flea markets…anywhere I could find them. They are all only English made transfer ware, and I still find pieces at thrift stores and garage sales. I absolutely love finding the different patterns and adding them to my collection! Phyllis, I, too, love blue and white dishes. When I moved in with my Daddy to take care of him after Mama died and Daddy was losing his eyesight, I wanted new dishes. Daddy requested that I get white ones so that he would not try “to eat the design on the dishes” due to his eyesight. I complied with his wishes, but added some variety with blue and white salad plates and mugs from Paula Deen’s collection. And I use blue goblets. Of course with using white dishes, I can add other accessories such as red and white for patriotic holidays, yellow and black for drama, etc. Wonderful for decorating tables for our Designing Women’s Event at our church in Pensacola! My love for blue and white dishes also stems from my Grandma who used Blue Willow Ware, and Flow Blue dishes. One of my treasures is a pin I had made from a piece of her broken Flow Blue china. I love blue and white, it’s always classic, and beautiful. I just wrote a blogpost about my favorite blue and white, Delftware. Blue and white just mixes with everything, doesn’t? I enjoy dishes of any kind, but lean towards transferware. Currently my red and white is in the rotation. Our Limoges is white, which also allows for mixing in other unrelated pieces, whether colorful (I have some gorgeous serving dishes from Jordan and Morocco) or just plain white. It allows for a lot of flexibility.